‘Kings & Queens of the Underground’ is the first album of new original material from Billy Idol since the 2005 release of ‘Devil’s Playground’ and only his third in over twenty years. Quality over quantity is the way to go. ‘Kings’ is the ideal audio accompaniment to his recently released memoir ‘Dancing With Myself’ as it looks back, but also forward as it adds some new elements to the Billy Idol sound that made him one of the biggest stars of the 80’s MTV revolution. The album was written and recorded with long-time collaborator / guitarist Steve Stevens and Billy Morrison (Royal Machines / Camp Freddy / The Cult) and produced, in the main, by Trevor Horn of Yes, The Buggles and Frankie Goes To Hollywood fame. The album has that unique ability which the best records have, to keep the listener interested as it covers a variety of genres and Idol is in fine voice switching from a deep, almost spoken, vocal style to a banshee scream when required. The vocal production on ‘Nothing to Fear’ is especially fine. While guitarist Steve Stevens demonstrates his versatility with some inspired playing. Idol recently claimed “Stevens is all the genres I need” and you can hear why. Nothing demonstrates this versatility more than the two songs that, for this reviewer, form the centrepiece of the album. ‘Postcards of the Past’ is pure vintage Idol, a driving rocker with that trademark Steve Stevens guitar sound and a stunning solo that has to be heard to be believed. While the lyrical theme of the song allows Idol to have a little fun slipping a few trademark vocal inflections into the mix. 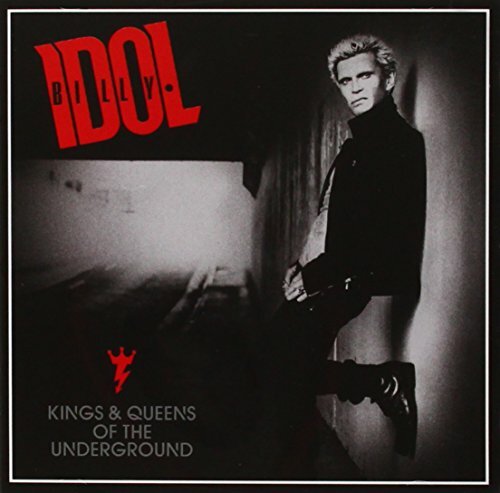 It’s one of many highlights on a fine album and is followed by the title track, ‘Kings & Queens of The Underground’ an autobiographical trip through the long career of Billy Idol. The song is an epic acoustic based orchestral folk ballad that works beautifully as it allows Billy to reminisce on the events of his career, the good, the bad, and the golden years. This one-two punch anchors the album and is as good as anything you’ll hear this year. ‘Bitter Pill’ is a catchy opening statement of intent with a galloping rhythm and crisp melodic guitar lines that sets the scene for the first single, the Greg Kurstin produced ‘Can’t Break Me Down’ easily identifiable as Billy Idol but with a modern twist and more hooks than any song has a right to have. As an introduction to the album I was initially unsure but the song has the ability to worm its way in, making it an interesting, and quite brave, way to go. If you only want another ‘Rebel Yell’ this might not be for you but I’d dig a little deeper, you’ll be glad you did. ‘Save Me Now’ has a modern take on an 80’s vibe as guitars flit in and out of the soundscape while synths pulse and the electronic backing pounds. The chorus is superb as the guitars kick in fully and the vocals are just perfect. Elsewhere ‘One Breath Away’ starts dark, moody and sensual until the unexpected instrumental mid-section steps things up a gear with some typically inventive guitar touches from Stevens to accentuate the “pressure”. ‘Eyes Wide Shut’ has another terrific vocal and a light, but rock solid, rhythm track with the bass especially well placed. The album takes its leave with ‘Whiskey And Pills’ an out and out rocker that features another fine Steve Stevens solo. It may have been nearly ten years since Billy Idol presented us with new original material but it has turned out to be well worth the wait. This may well be the finest album of his career.